On January 7th, 2012, Zen Master Sunim Hwasun Yangil met with two of his senior students, Chris Warren and Dalton Grizzard, and an agreement was made for the continuing leadership of the Sangha at the Awakened Meditation Centre (AMC). 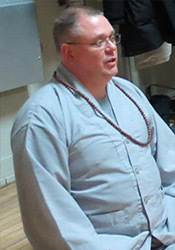 Chris Warren has been a Dharma teacher for many years, leading the evening chanting and tea ceremony. He took the Dharma teacher precepts in 2009 from Zen Master Hwasun Yangil Sunim. Chris has participated in many retreats at the Awakened Meditation Centre, Won Gak Sa in New York state, The Detroit Zen Center and elsewhere. We the teachers of the Awakened Meditation Centre of Toronto, commit to develop and protect the long term well-being of the Sangha and to work for the common good of all sentient and insentient beings. The Awakened Meditation Centre traces its Dharma roots from the early beginnings of Buddhism in India. From India, the Dharma spread to China, and then from China to Korea. 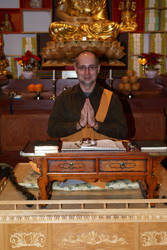 After centuries of development into the unique Korean Buddhism of today, the Dharma was brought to Canada. Awakened Meditation Centre is thus rooted in the Korean Zen tradition of Buddhism, and is a branch of the Jogye Order in South Korea. Although the Jogye Order is a monastic discipline, the Awakened Meditation Centre has a lay Buddhist sangha of followers. The line of authority for teaching in lay Buddhism is modeled after the Jogye Order. Therefore, the Awakened Meditation Centre has a Zen Master, Dharma Teachers, and 11 Five Precept students, as well as students who have not taken the precepts but attend regular classes and meditation sessions at the centre. Students are guided by the Dharma teachers under the guidance of Zen Master Hwasun Yangil. In effect, everyone at the centre is expected to follow the Jogye Order rules. The teaching and administrative authority for the centre is vested in Zen Master Hwasun Yangil, and the designated Dharma teachers. Each Dharma teacher will publicly represent the Sangha, and will participate in promotion and development of sangha-wide activities. 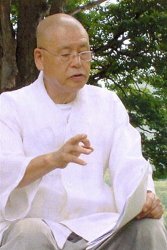 Zen Master Hwasun Yangil maintains veto power over decisions of the Dharma teachers, who are expected to assist in the over-all decisions for centre activities and operations. In teaching, the Dharma teachers will observe Zen Master Yangil’s teaching methods, and may promote their own teaching methods only outside of the Awakened Meditation Centre. 1. Common teaching and practice, as expressed by yoga, tea ceremony, bowing, chanting, sitting and walking meditation, retreats, ko-an interviews, and dharma talks. These practices form the backbone of our tradition, and must be accepted in their totality. 2. Common method of teaching as defined by the Dharma teachers. Guidelines will continue to be set by Zen Master Hwasun Yangil, for the teaching method followed in the Centre. Dharma teachers are responsible for teaching, training, and practice at the Awakened Meditation Centre, under Hwasun Yangil Sunim’s guidance. The Awakened Meditation Centre forms a spiritual community that supports the Zen meditation practice and the friendship among the members. The centre serves as a place for cultivating mindfulness of the present moment and learning the Ganhwa Zen meditation that will enable awakening of the mind. The centre offers weekly Zen meditation classes and one-, three-, and seven-day retreats as well as other workshops and activities that promote the mind of wisdom and compassion. The classes are held from 5:00 pm to 8:00 pm every Saturday. The centre, a non-profit and charitable organization, requests a tax deductible donation of $20 for each class or $50 monthly for the membership fee. There’s no charge for the first class.